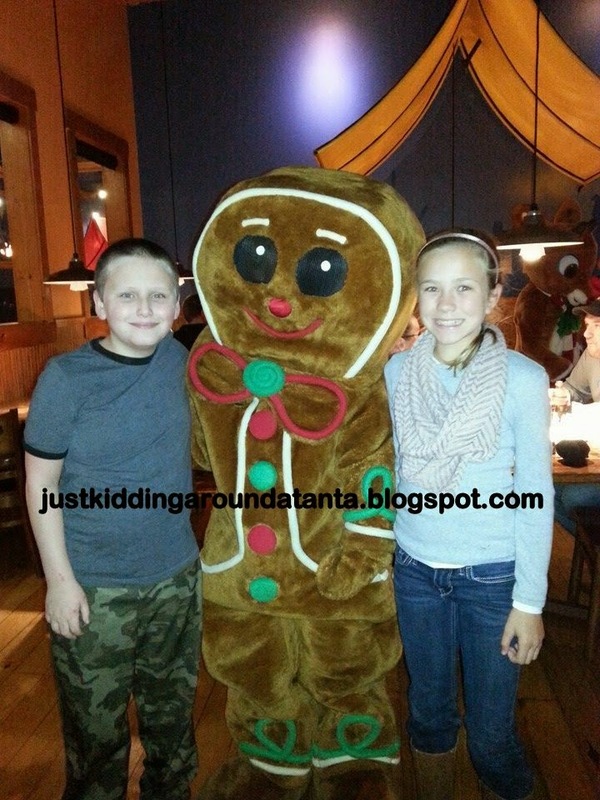 This blog is about our adventures exploring, learning and just having fun! I share giveaways, product reviews, and family-friendly places to visit around the Southeast. And since I love cooking and DIY, you'll find some of that here as well. When I find great deals, I'll share those too. Thanks for stopping by! Last week we attended Stone Mountain Christmas with my sister and niece. We spent a wonderful evening getting our Christmas spirit on. 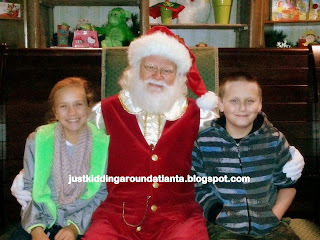 Unless you are the Grinch, there is no way you can visit and not leave feeling Christmas Joy in your heart! Now through January 4 (on select dates) you can enjoy the Christmas glow of over two million lights, plus a hilarious 4-D movie, live shows, a parade, the Singalong Christmas train, and so much more! The Nightly Christmas Parade: Catch a glimpse of all of the characters and actors as they arrive in Crossroads each evening. Music, dancing and lots of fun await! We found a place near the 4-D theater to watch and it was perfect! Ice Age: A Mammoth Christmas 4-D movie : it may be short in length, but it is jam-packed with fun. There are lots of 4-D effects to thrill the kids, so be prepared and put your phones and cameras safely away so they don't get wet! My son and niece are 10 and they both thought the movie experience was terrific. The Singalong Christmas Train: It's not Christmas if we didn't get to take a ride on the Christmas train! Sing carols, look at Christmas lights, watch the antics of two silly elves on the monitors throughout the train cars, and watch "The Gift", a touching live presentation about the real reason for CHRISTmas. The ride lasts about 40 minutes, and it can get chilly on the open-air cars. Make sure you've got mittens and hats! 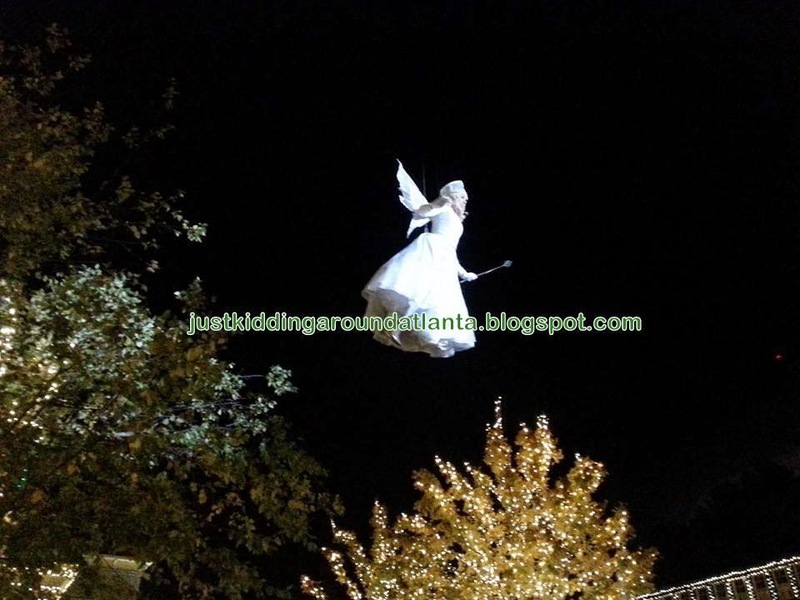 It's one of our favorite parts of Stone Mountain Christmas. 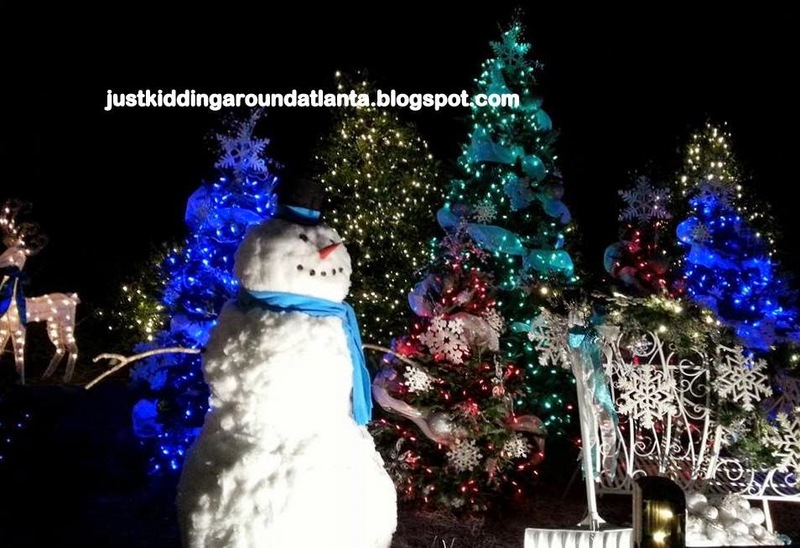 Character meet and greets: your kids can meet Bumble, Rudolph, the Snow Angel and more characters while checking out all the great fun at Stone Mountain Christmas. You can even visit with Santa! We love to eat at The Campfire Grill. The Campfire Skewers are delicious and the S'mores Skillet is amazing. 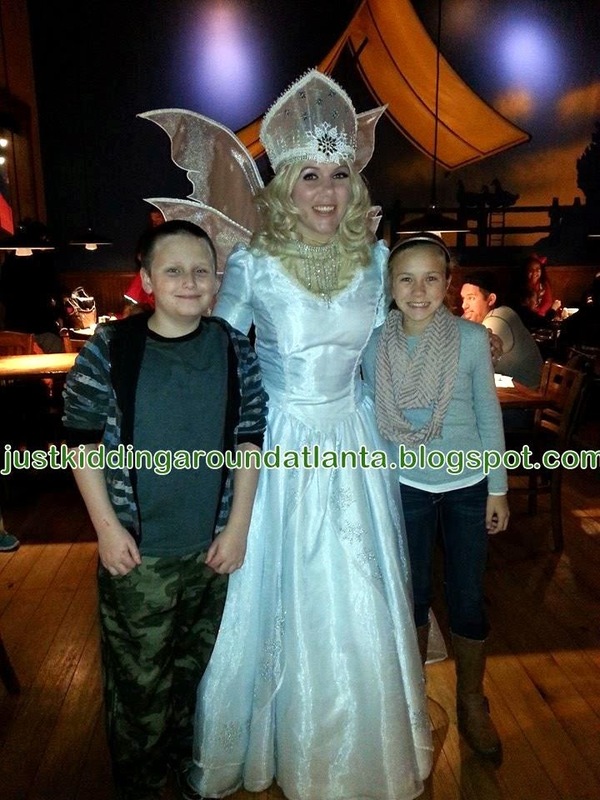 They have lots of fun camping and forest-themed effects throughout the restaurant to keep the kiddos happy too. Always good food, good service, and a good time at The Campfire Grill. 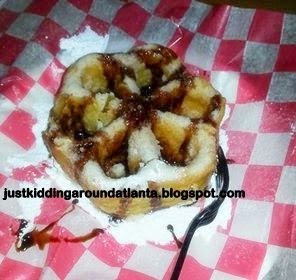 Make sure you try the Funnel cakes and Snowflakes (basically a deep fried belgian waffle) for dessert. Order them plain or add sauces, fruits and toppings. 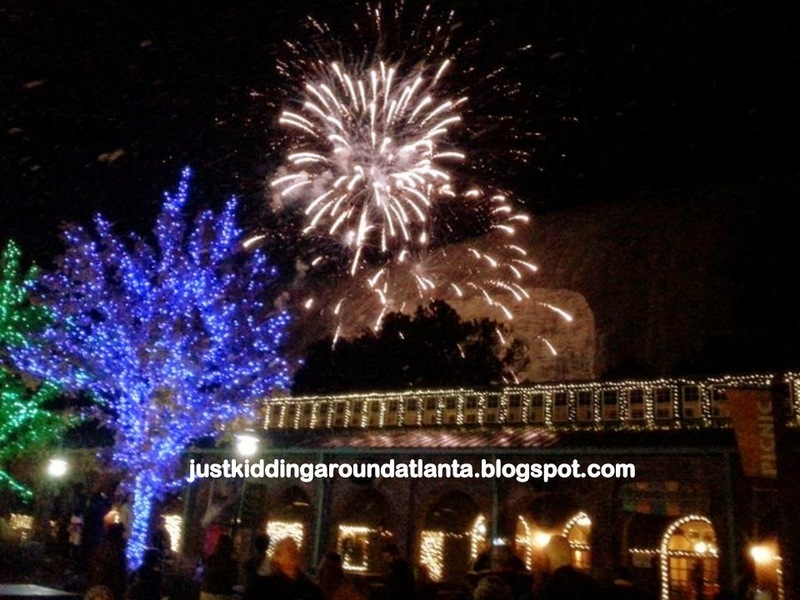 The perfectly sweet ending for an evening at Stone Mountain Christmas. Stone Mountain puts on fabulous Christmas shows ~ there is something for everyone. From Toyrific to Forever Christmas, you will enjoy great music and entertainment for the whole family. Click here for a list of all of the shows you can see this year. Need a shopping break? 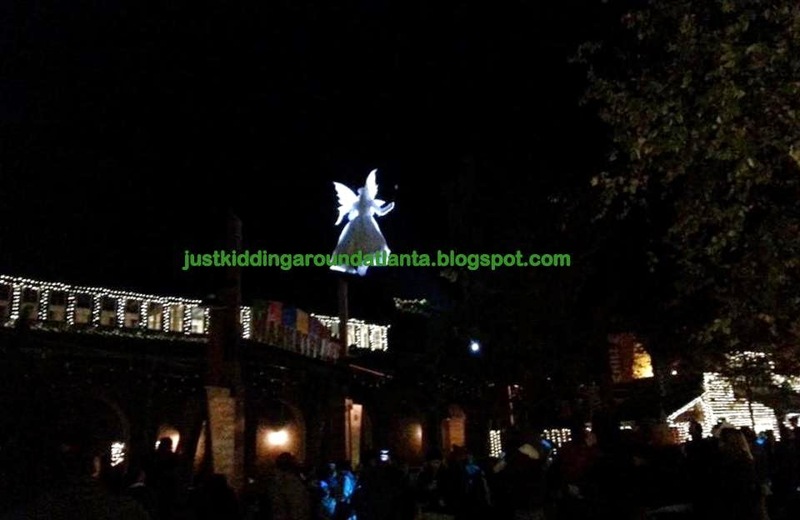 There are lots of places to shop at Stone Mountain Park. This year we came home with a beautiful, hand-blown glass Christmas ornament from The Stone Mountain Glass Shop, made right there! They also have a toy store, candy store, a gift shop in the train depot and other spots throughout the park. You can find some great Christmas gifts there! 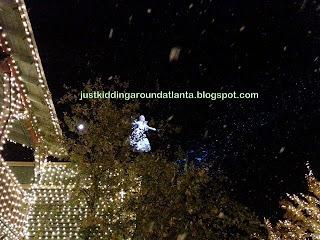 Until this year, we've never been able to stay long enough for the Finale with the Snow Angel, Fireworks and Snowfall. We live about an hour away, so we usually ended up taking the kids home for bed before the 9:45 finale. This year, however, we were determined to stay til the very end and it was SO worth it! The Snow Angel flies in and floats above you, then she starts a glorious fireworks show complete with snow! To see the wonder in the eyes of all the kids there was magical! 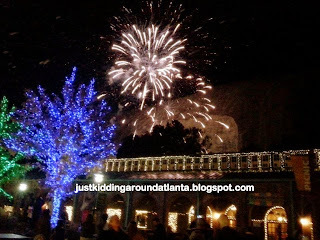 I highly recommend that you stay and experience the Finale when you visit Stone Mountain Christmas. We thoroughly enjoyed our evening at the Park, and I hope you and your family can attend too! It's a nice way to reconnect with your family, and enjoy lots of holiday entertainment. 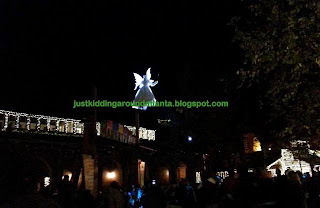 Have you ever visited Stone Mountain Christmas? If not, what is your favorite Christmas event to attend? Leave me a comment below! 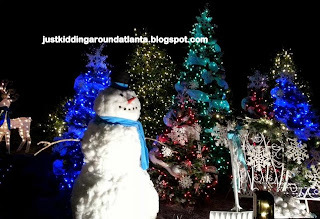 Disclosure: Stone Mountain Park invited us out for an evening at the Park to preview Stone Mountain Christmas in order to review it. No other compensation was received, and all opionions given here are my own. It looks like you had a great time! Love Stone Mountain! Its been several years since I've visited Stone Mountain. It looks like that have a lot more to offer than in the past. I love reading your comments - thanks so much for taking the time to leave me one! If you are new here, please leave me your blog link so I can come by & say hi there, too! Like what you see? Click The Picket Fence button to vote for my blog! Looking for something? Check Amazon! My lunch with Paula Deen..
Paula Deen Live! 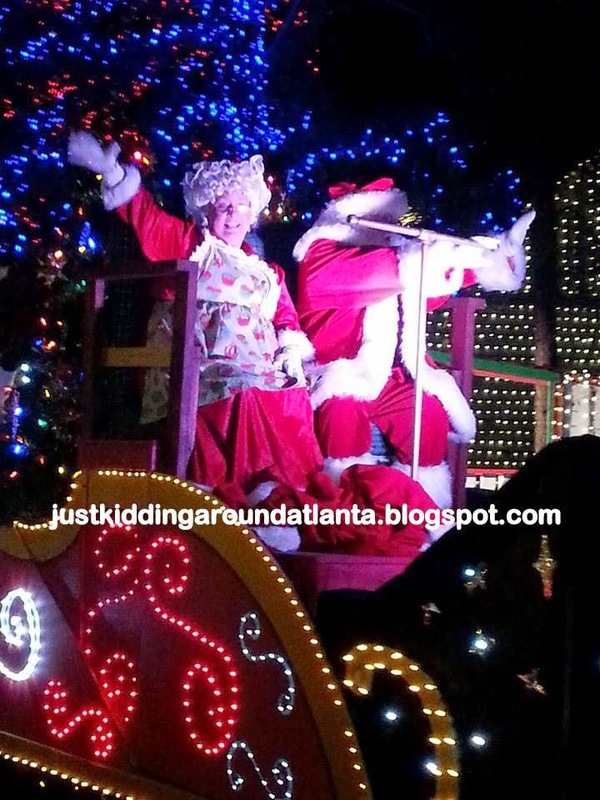 Holiday Show Atlanta area only! Aimee @ Explore, Learn, Have Fun!